What happens if a ProbeFor* call or user memory access takes place outside of a try/except block? Typically nothing, but an authenticated, local attacker could exploit such a bug to cause an unhandled kernel exception (by passing in an invalid pointer or invalidating it during syscall runtime), and consequently crash the entire operating system with a Blue Screen of Death. Therefore, the Bochs instrumentation can iterate through the SEH chain, determine which handlers are enabled and which functions they correspond to. If there are no exception records present, or all of them have their TryLevel fields set to 0xFFFFFFFE, then an exception occurring right at that moment could potentially bring the operating system down. It should be noted, however, that not all non-guarded accesses to user-mode memory are dangerous by definition: regions previously secured by the MmSecureVirtualMemory API and special areas such as TEB or PEB are not affected. I ran the detection logic explained above against the latest builds of Windows 7 32-bit and Windows 10 32-bit, and found a bunch of bugs. Due to their low severity (i.e. local authenticated DoS), they do not meet the bar for security servicing by Microsoft. However, I still believe that many of them are interesting cases, and so I am planning to periodically release PoCs, crash dumps and short explanations of these issues in the upcoming weeks on this blog. I hope you will find them interesting or entertaining. Today, I will be discussing a bug in the win32k!NtUserThunkedMenuItemInfo system call. Enjoy! The set of state flags which can be legally used by a client application are well defined in MSDN: they’re MFS_CHECKED, MFS_DEFAULT, MFS_DISABLED and MFS_HILITE (jointly MFS_MASK). Other bits in the 32-bit state field are used internally by win32k.sys, and thus should not be manipulated by user-mode programs. The if statement shown above is responsible for ensuring that no prohibited flags are being set from outside the kernel. As you may have noticed, the fact that the fMask and fState fields of the input structure are referenced twice (in the inlined memcpy and during the direct bit tests) means that there is in fact a double-fetch condition here. As a result, the sanity check in the code can be bypassed by modifying the value of either of the two fields in between the two accesses in a concurrent thread. Even though this is possible, in my assessment the problem doesn’t really have a security impact, as none of the internal flags seem overwhelmingly interesting, and some extra internal validation checks were added in win32k.sys as a result of fixing this bug discovered by Tavis Ormandy in 2010. 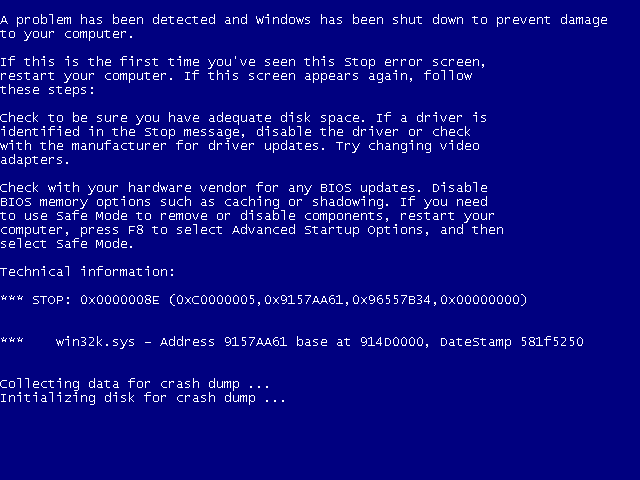 In order to trigger the BSoD that is the subject of this post, it is required to race the permissions of the user-mode memory page that is being accessed, such that the first guarded access (the memcpy) executes with no interruption, but the second (unhandled) one generates an exception. Since changing memory access rights is generally a costly operation (in the context of beating a tight race condition window), the bug is easiest to reliably trigger on machines with ≥2 cores, as then one thread can continuously invoke the affected syscall, while the other alternates between PAGE_NOACCESS and PAGE_READWRITE rights using the VirtualProtect API. Running the two threads each on a separate core greatly improves the odds of quickly hitting a system crash. // Indefinitely alternate between R/W and NOACCESS rights. // Initialize the thread as GUI. // Allocate memory for the buffer whose privileges are being flipped. // Create the racing thread. // Infinite loop trying to trigger the unhandled exception. And that’s it! I hope you enjoyed the post, and see you in the next one!